Summer is the peak time of the year for lightning strikes and lightning fires, especially on the Outer Banks. However, lightning does occur year round. It’s important to be prepared. Did you know that lightning can reach up to 50,000 degrees Fahrenheit? That’s hotter than the surface of the Sun! According to the National Weather Service, lightning starts an average of 4,400 house fires annually and countless outdoor fires. You may have heard the phrase, “When Thunder Roars, Go Indoors”. If you can hear thunder, you are within striking distance of lightning. Look for shelter inside a home, large building, or a hard-topped vehicle right away. Do not go under tall tress for shelter. There is no place outside that is safe during a thunderstorm. 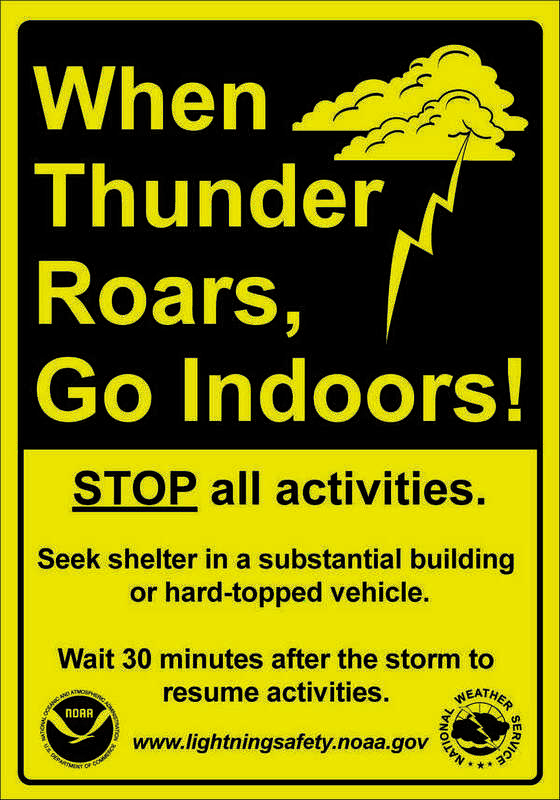 Wait at least 30 minutes after the last thunder before leaving your shelter. From 2004 to 2013, there were 13 lightning fatalities in NC. North Carolina is in the top 10 nationwide for lightning fatalities, according to the NWS. If you are in or on open water, go to land and seek shelter immediately. Get out of the water! If you feel your hair stand on end, that means lightning is about to strike, put your feet together and squat low to the ground. Place your hands over your ears and duck your head. Make yourself the smallest target possible and minimize your contact with the ground. Do not lie flat on the ground. This is a last resort when a building or hard-topped vehicle is not available. If a person is struck by lightning, call 9-1-1 and get medical care immediately. Lightning strike victims carry no electrical charge so give them assistance immediately. Check their breathing, heartbeat, and pulse. CPR may be needed. At home during storms, unplug appliances and other electrical items, like computers and TV’s, and turn off air conditioners before the storm (to reduce the chance of being electrocuted). If you are unable to unplug them, turn them off. Stay off corded phones, computers, and other electronic equipment that put you in direct contact with electricity or plumbing. Avoid washing your hands, bathing, doing laundry, or washing dishes.